Soon after the announcement about the new terms and conditions of the TemplateMonster Affiliate Program 2.0, we saw new partners signing up and joining the community of affiliates. From now on, affiliate partners earn a 30% commission from the initial order placed by a customer via a referral link, with every following order resulting in a commission of 10%, which is delivered to the personal account. As soon as you earn $100, you can withdraw the earnings. Let’s find this out in this post. So, dear affiliate partners, make yourself comfortable and keep reading further. When you become an affiliate partner, you enforce sales of the of business templates or any other digital products from the TemplateMonster digital marketplace by using their promotion via your own channels. Each time a user clicks on your referral link and completes a session with a purchase you receive an affiliate commission. The commission is paid on all sales placed through affiliate links, banners, affiliate template section, and affiliate shopping cart within the basic TemplateMonster affiliate program. The first unique customer sale will result in the 30% commission. All further sales bring the 10% earnings. The commission from other TemplateMonster affiliate projects like www.templatetuning.com and www.motocms.com is also 30% and 10% per the first unique customer sale and all further sales, respectively. How to Track Your Progress as an Affiliate? TemplateMonster affiliate program tracks sales that were placed via affiliate shopping carts and affiliate links/banners differently. Affiliate links sales are tracked via the affiliate ID, which placed at the end of the referral link, and saved as a cookie for 365 days. Affiliate shopping cart sales are tracked via the affiliate preset code, which is generated in the affiliate account of every partner. To see the current balance on your affiliate account, you will need to log into the Affiliate Program Center and check the balance in the Consolidated Balance section. 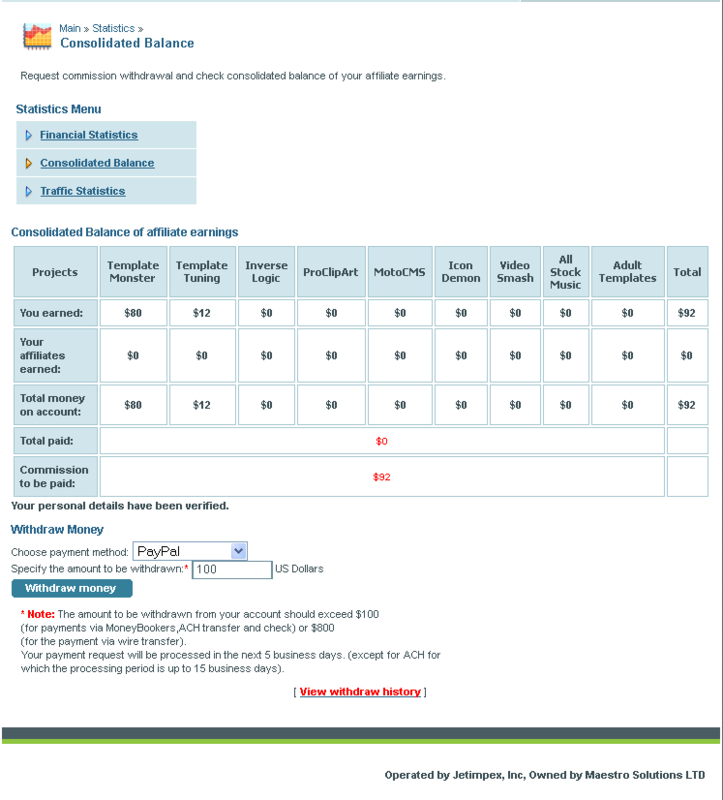 To check your affiliate earnings and the revenue of your sub-affiliates, click Statistics > Consolidated Balance. You will reach the page where your pending commission withdrawals and all previously made payments for your affiliate account are listed. When you decide to withdraw your affiliate earnings for the first time, you should be ready to verify your personal details. This is a one-time verification, which was added for security purposes exclusively. To verify your personal details, you will need to upload a copy or your passport or driving license. Please mind that in case any of your personal details are changed, you will need to update the information in your profile and upload a copy of the new document once again. As soon as your uploaded copy is verified, you will receive the respective notification in Consolidated balance. Also, you will be able to access the fund’s withdrawal settings, including the payment methods and the amount of money that you want to withdraw. To initiate the affiliate commission withdrawal, click the “Withdraw Money” button and specify the payment method through which you’d like to process the commission. These include PayPal, Skrill, WebMoney, Payoneer Prepaid MasterCard and Wire Transfer. It will take up to 5 business days to withdraw money via all payment methods except for Wire Transfer. Choosing the latter, you will receive the money within ten business days. Mind that you can request the commission payout when you earn $100 or more. request a withdrawal from Consolidated Balance by clicking Withdraw Money > Choose Payment Method > Payment Details. Making money with little to no effort has become possible with TemplateMonster Affiliate program. Whether you are a blogger, a marketing specialist or a web developer, you can multiply your earning while joining the affiliate program. 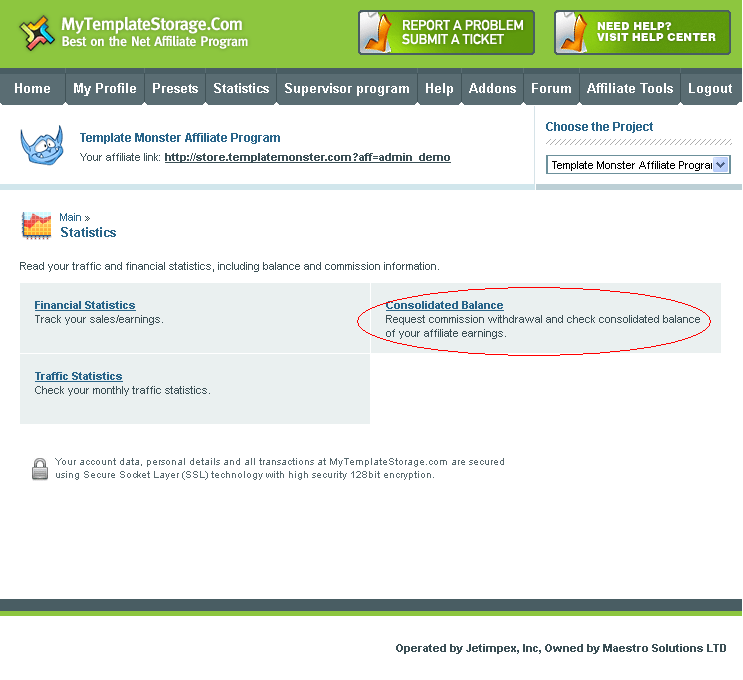 TemplateMonster marketplace provides beneficial terms and conditions for the affiliate partners. In addition to paying 30% for the initial client’s purchase, the affiliate program provides you with a set of free tools that you can use to your benefit. All affiliate partner can rely on the professional support of the personal affiliate manager 24/7. He will help you with the choice of the most effective tools that will appeal to your target audience. Whenever you decide to start taking your first steps as TemplateMonster affiliate, you can bookmark the Knowledge Base page containing the answers to the frequently asked questions, user guides, manuals, tutorials, and other helpful data.